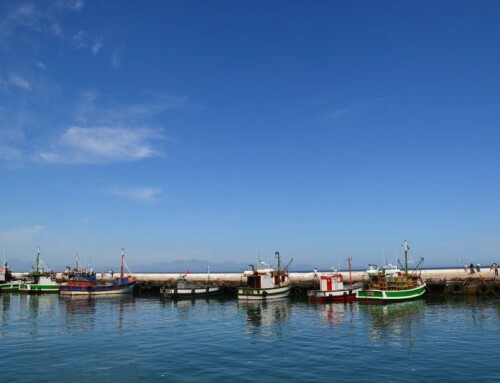 This historical gem on the False Bay coastline packs a lot in for such a quaint little village. Simon’s Town is a quiet harbour with a naval base, a rich history, charming shops, restaurants for every taste and more activities than you can do in a day. The best thing; you don’t even need a car to get there. 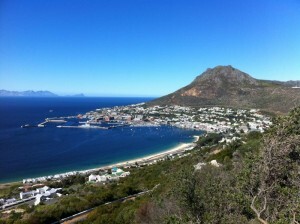 If you are looking for a day of sun and sea, Simon’s Town is the place to be. North facing and located on the shores of False Bay, it has warmer water and more sunlight than most places in the Cape. 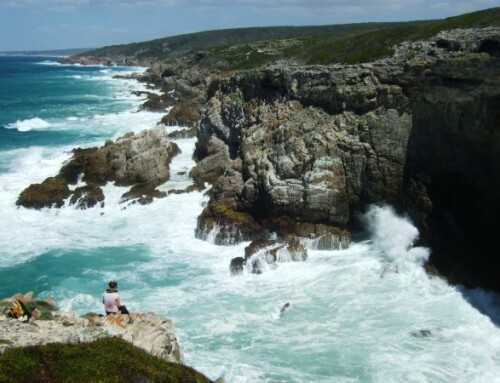 This sheltered little harbour can be anything from a lunch stop on your way back from Cape Point to a full day outing. In fact, this village is so charming you might just end up moving here. If you are staying in town, take an early train into Simon’s Town. After the yellow and silver coaches have rattled past the eastern slopes of Table Mountain you will pass the reeds of Zandvlei and soon smell the sea. Once you have passed Surfer’s Corner (on a sunny day you will find hundreds of these carefree souls splashing in the waves), it is ocean views all the way to your final destination. 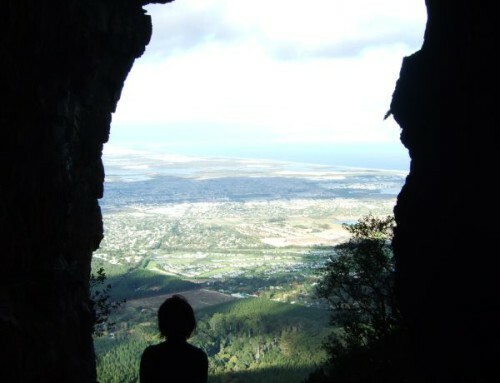 The Cape Town – Simon’s Town line is one of the safest ways to travel in the Mother City. 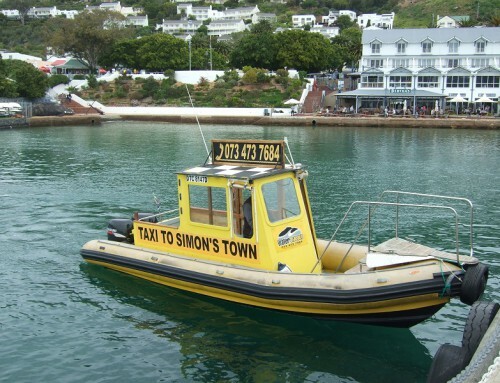 Buy a Metro Plus ticket, and this will take you to Simon’s Town in about an hour for R13. Try getting anywhere in London for that price. While you’re on the train, keep an eye out for the marine life. While seals can be seen all year round, spring in Cape Town is whale season. Colossal Southern right whales can be seen frolicking all along the shores of False Bay. Take a pair of binoculars and watch the playful mammals from dry land or book a whale watching tour to get closer to the action. 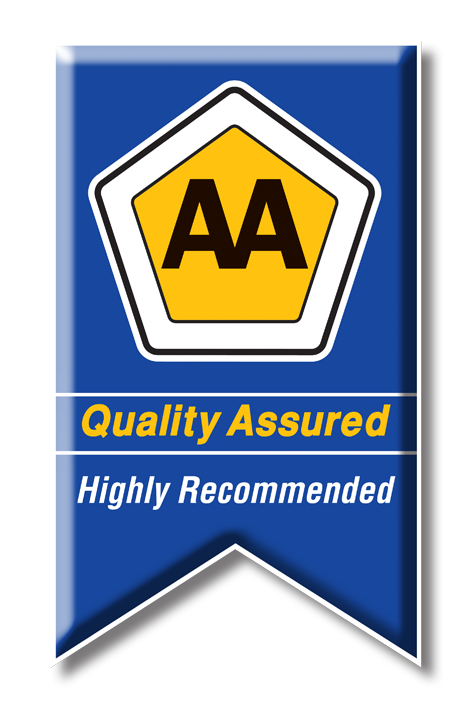 Enquire at any tourism office to make a booking in advance. 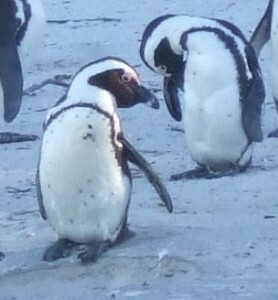 The cute little jackass penguins in their tailcoat costumes are a firm favourite with Cape Town’s visitors. Get here in the morning while the loud and smelly buggers are still in action. While the aquatic birds look rather wobbly on dry land, they transform into black bullets as soon as they break the surface. If you want to cuddle, stick to the soft toys from the souvenir shop. The real birds do bite. The 75 000 furry inhabitants of the aptly named Seal Island are an attraction in themselves. What is more, the playful mammals attract the apex predator of these waters; the great white shark. In winter, especially, you will have great chances of witnessing the natural hunting behaviour of these boat-sized fish. The gruesome images of great whites munching seals in mid-air are all taken here in False Bay. In spring, boat trips to Seal Island will make for some incredible whale watching. 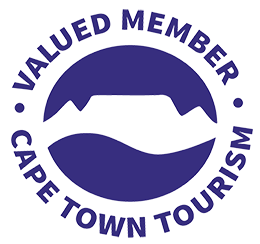 Enquire with any tourism office to make a booking. The story of able seaman Just Nuisance is a curious one. Just Nuisance was the only dog, a Great Dane to be more specific, to be enlisted in the Royal Navy. Even though he was buried with full military honours, the canine never sailed to sea. The large dog earned much affection by acting as a morale booster during World War II and by escorting drunken sailors home from the pub. The community of Simon’s Town honoured this unusual specimen by erecting a statue on Jubilee Square. 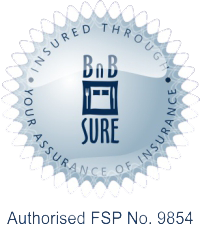 Read more about Just Nuisance. Simon’s Town has so many little wonders to discover that sometimes your best plan will be to have no plan at all. Ease into the slower pace of the laid back seaside village and take a stroll through the side streets. You will find many little shops full of personality, unpretentious museums and many things that are not in the tourist guides but can make for a memorable holiday. Of course it would be a shame not to sample some of the culinary diversity this tranquil little port has to offer. Some recommendations to get you started are Bertha’s Restaurant, Salty Sea Dog, Seaforth Restaurant and the Tibetan Teahouse in the Sophea Gallery. Just past the penguin colony is Boulders Beach, one of the warmest and safest beaches on the whole peninsula. For a nominal entrance fee you can swim in the warm(ish) False Bay water with penguins darting past you. Boulders Beach is sheltered from the wind and catches no swell at all, so it is safe even for the toddlers. Other popular beaches are Seaforth Beach with a natural swimming bay and picnicking lawn, and Glencairn Beach between Fish Hoek and Simon’s Town. Bay in a sea kayak. Professional guides and ridiculously stable boats make this a fun experience; even for landlubbers. Get up close with penguins, seal and even whales when the season is right (August to November is best). Submarines are an extreme environment. Requirements of minimal space and maximal functionality left little space for luxury. Take a tour of the retired SAS Aaaegai and get a feel for life under seas. Apparently the guide in the engine room has a strong Scottish accent for the real Red October vibe. The Scratch Patch and Mineral World is a hit with the kids. 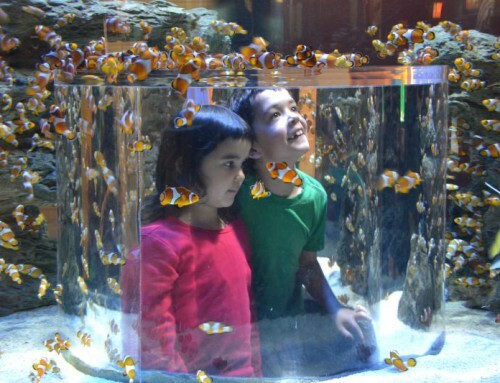 Let the little ones dive into a large area filled with tumble polished gemstones. Equipped with containers that vary in price and size, children can sift through a sea of Tiger’s Eye, Rose Quartz, Amethyst, Jasper, Agates and Crystals and take home whatever they can fit in their bag. A great option if the weather is too miserable for the beach!